Southern California travel has endless possibilities for entertainment. Mountains, beaches, Disney, bustling cities, and deserts close by, everyone can find their adventure. La Jolla is no exception! 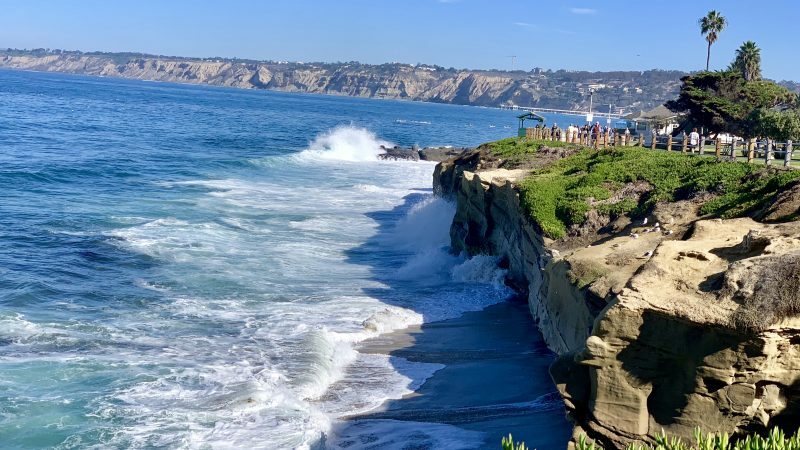 Even outside the traditional beach season, La Jolla is packed with beach walks, mountain hikes, stunning vistas, high-end shopping, excellent food, and even wildlife! My husband and I traveled with our three kids to La Jolla, California, in late November. I was worried. Will it be too cold for the beach? How will I keep my kids from going crazy indoors if we can’t go in the ocean? Crisis averted! I found twelve great outdoor activities with breathtaking views and local wildlife all with great food nearby (never forget the food). The kids loved these activities, too! Some of this was out of my comfort zone, but it was worth it. 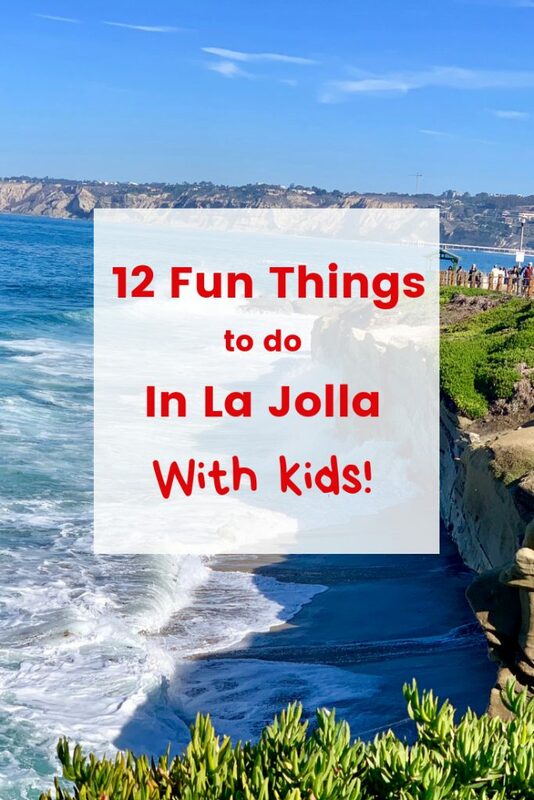 It was so much fun that I had a hard time cutting the list down to 12 things to do in La Jolla California with kids. My first recommendation, especially if it is a cloudy day, or if you are up too early for the beach (like we were), is to head up on a scenic drive to Mt. Soledad. Plenty of signs guide you up the mountain’s scenic route, and when you follow them, you will not be disappointed! The curvy, but not scary, mountain roads offer ocean and city vistas from every turn. Perched on the top of Mt. Soledad (the mountain in La Jolla), the Mt. Soledad National Veterans Memorial offers a beautiful vantage point from which to view San Diego. From the top, there is almost a 360° view of San Diego. On a clear day, you can see Sea World! Often called a unique memorial, it commemorates veterans (both living and deceased) from every conflict in our nation’s history. 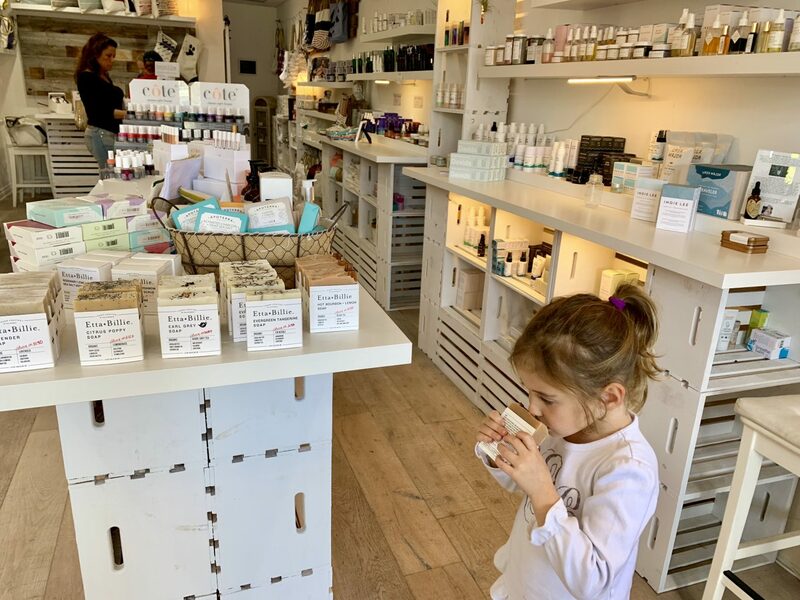 One of our favorite things to do, especially when the kids are jet-lagged (after flying in from Maryland) and up super early, is to head to Juice Crafters. This Southern California franchise provides delicious, healthy way to start the day. The juice artisans will happily split a smoothie into several cups for the kids. My kids loved the crunchy monkey, with cacao nibs that made them think it’s chocolate, walnuts, and goji berries (for protein and some vitamin C after a long flight).. I really like the bowls and the Green Soul smoothie, which has just enough sweetness with the pineapple and banana, to counteract all of the green (kale, celery). 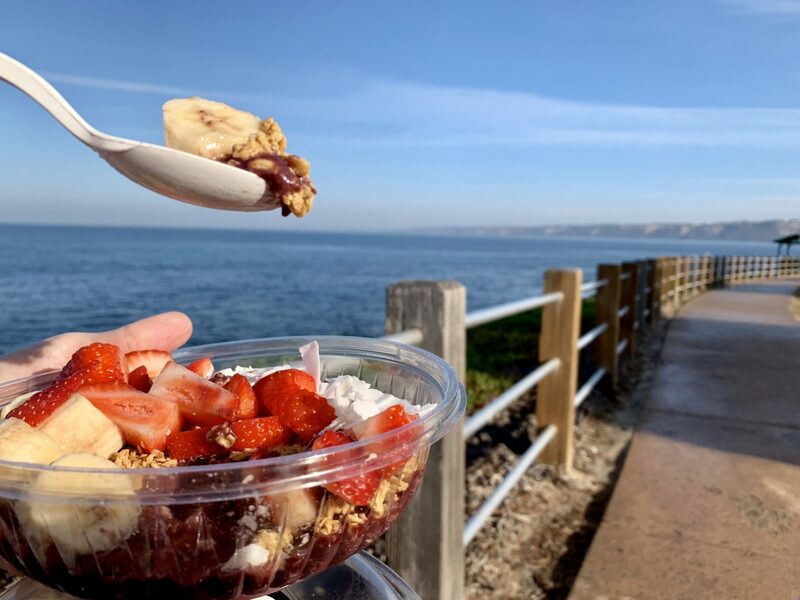 After we grab our smoothies, we walk down to La Jolla Cove. The cove starts at a small beach, where we like to watch the groups learning to scuba dive, and follows a walkway along the water to the Children’s Pool. It was interesting to see some older kids (I would guess high school age), learning to turn on their tanks, and help one another with the gear. Along the walkway is a lovely green space where the kiddos can run free. Keep a look out for the seals and the sea lions all along that path. We have seen them so close, that you can reach out and touch them (BUT DO NOT!!!) from the pathway. On the other side of the pathway from La Jolla Cove sits the Children’s Pool. 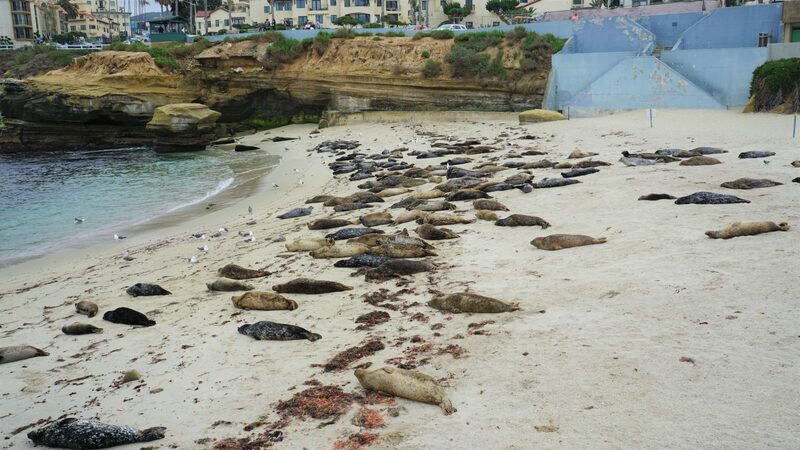 The little beach could be somewhat family friendly if the tide is right, but the seals and sea lions have taken it over! Sadly, that means that the beach is typically inaccessibility to people, but it sure is fun to see the seals and sea lions. We often walk on the jetty to watch them frolic in the waves and on the sand. This whole walk is a MUST do in La Jolla with kids! La Jolla has a lot of unique dining, with everything from Thai food to the Melting Pot, but one thing that is purely Southern California cuisine is the Parakeet Cafe. California cuisine usually incorporates what is fresh, local, seasonal, and oftentimes, pretty darn healthy. Located just steps from Juice Crafters on Silverado street, this made-for-instagram restaurant, with its neon and wallpapered walls, is worth a stop. It has a huge variety of coffee, with everything from a traditional cappuccino to a turmeric latte (which has no coffee added to it, but a ton of folks ordered it as I stood there). The barista serving up our beverages clearly loves the craft and there are a variety of healthy (while YUMMY) food and baked goods! Seal Rock is on the other side of the Children’s Pool, the jetty that I mentioned where you can get up close and personal with the seals and sea lions. Look for the informative signs that will help you discern the difference between the two. The temperature drops as you approach the ocean walking the Seal Rock paths. This wasn’t too much for our hardened East-Coast children, but, for me, I wish I had brought a jacket. Which brings me to being a tourist in a warm weather area. The La Jolla weather in late November was wonderful for us Marylanders, but you would have never guessed it from the way the locals were dressed. While we were sun-worshiping in shorts, T-shirts, and flip-flops, the locals were in boots, puffy coats, and hats. I even saw a lady in a full-on trench coat, scarf, and stocking cap. I can’t imagine how ridiculous we looked to them in our summer outfits. I really like to do a little shopping, or just take a walking tour of the shops (when I am on vacation), Girard and Prospect are my pics. You can find retail outlets like Kate Spade, antiques, as well as local purveyors like Balboa Candy. A trip along Girard with the kids wouldn’t be complete without a stop at Geppetto’s Toys store. A San Diego tradition for over 40 years, kids of all ages can browse for hours in its whimsical books and crannies. There really aren’t very many old fashioned toy stores around anymore, and my kids loved browsing the shelves. Best for older kids, or for more experienced hiking kids, Torrey Pines State Park is a fun trip. I thought it best for more experienced hikers (or smaller kids in hiking backpacks), because of the narrow trails with crumbling cliffs on them. There are lots of fun, scenic trails along the cliffs and down to the beach. Be aware that there may not be beach access, depending on the surf. 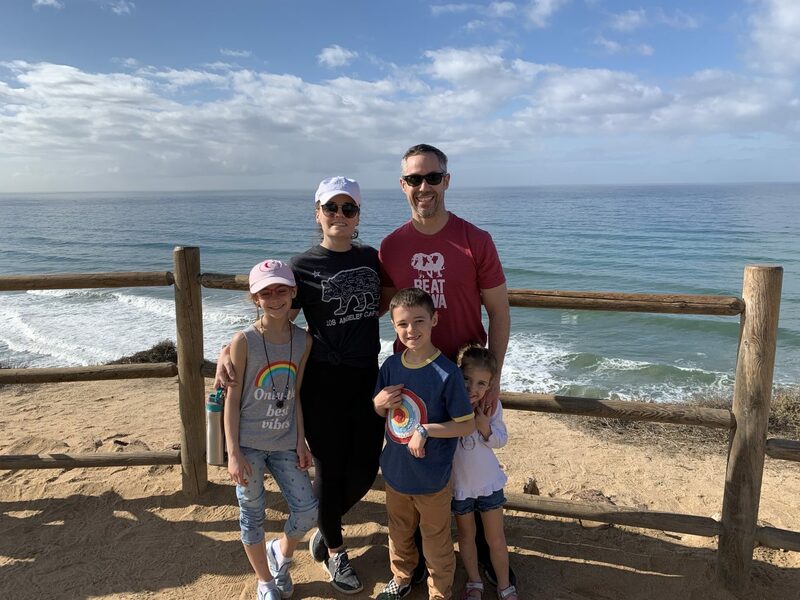 Torrey Pines has majestic, red sand cliffs that you can climb for the perfect photo opportunity (just like we did in our picture), or to see the spectacular views from the top. 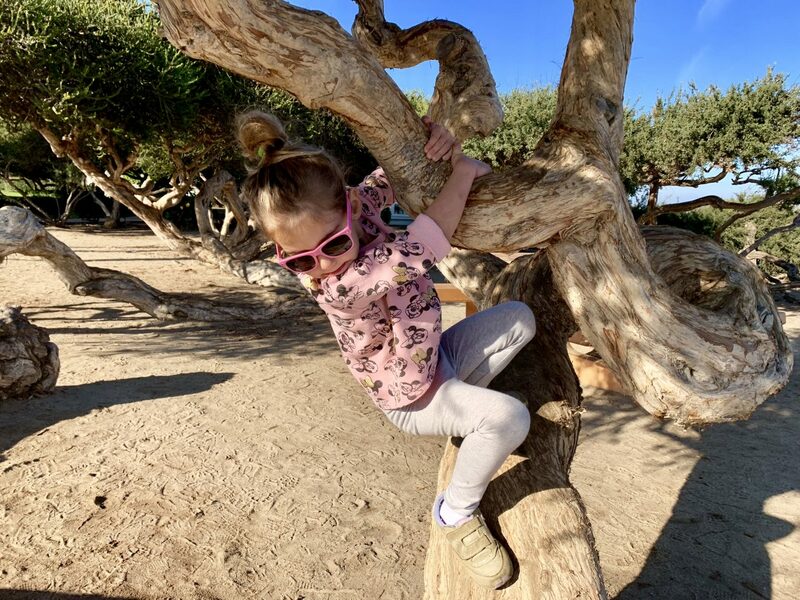 Read more about hiking with kids in San Diego in this Traveling Mom article. No trip to California would be complete without a trip to the beach. La Jolla Shores Beach offers plenty of parking, and lifeguards on duty (which is very important for smaller swimmers). It is also the perfect place to take a surfing lesson from one of the many companies operating there. Adjoining the beach is Kellogg Park, which is full of large grassy areas, and a playground with the perfect climbing trees. My kiddos love those trees because they are low enough to the ground, that even the smallest kiddo can partake. My favorite Street Corn at the Taco Stand in La Jolla. Photo credit: Christy from Stained with Style. 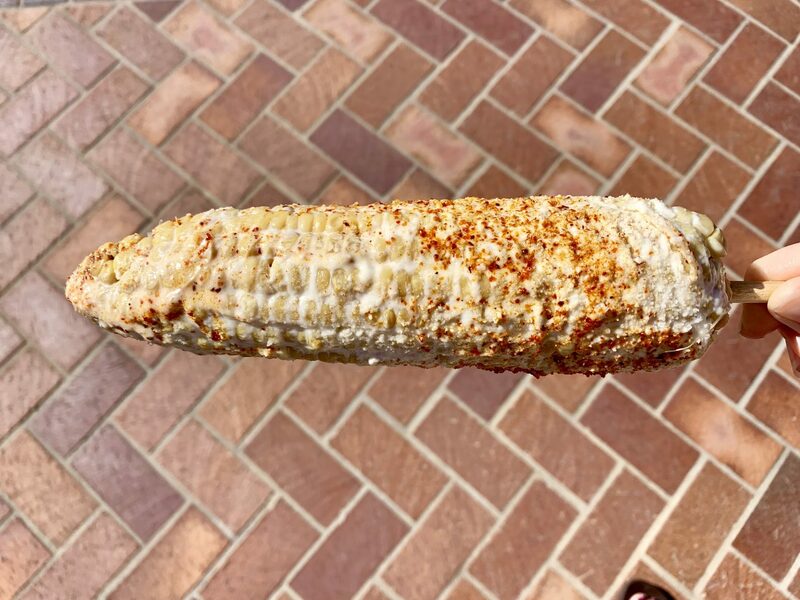 One of our favorite San Diego treats is the Mexican street corn from the Taco Stand. The Taco Stand is a La Jolla local favorite for burritos, and unless you arrive early (or late), expect to find a line. It is one of our family must stop visits in San Diego! Besides the corn, a fun/unique treat is the California burrito. It even comes with french fries inside, which is something I have never seen before. Conveniently located in La Jolla the Birch Aquarium is a kid-friendly museum with lots of hands-on activities. Read more about it in the Traveling Mom post, Ocean Explorations at the Birch Aquarium. These, are just a few of the MANY things to do in La Jolla and in Northern San Diego. 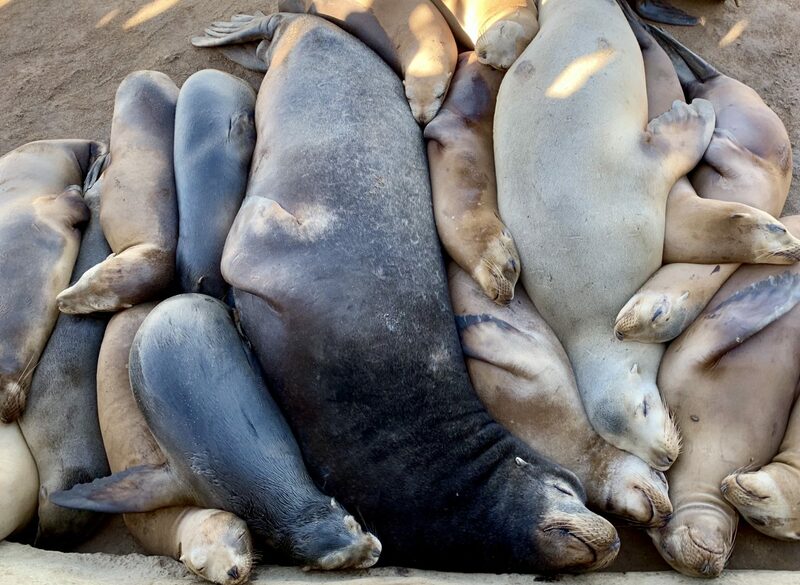 From seeing the seals, and hiking, to trying a new Southern California style cuisine. Get outdoors and enjoy! Christy is a glam crunchy mom of three preschool and elementary aged kiddos, one on the autism spectrum. She has a Master’s degree in special education, and never turns down an opportunity to travel anywhere she can, and lists the Maldives, Seoul, and Hawaii among her favorites. She shares her love of traveling with her kids by taking them along whenever possible. Preferably if there is a beach, pampering, and amazing food involved! Rely on her insights to make family travel possible for everyone, including special needs kids and their parents. 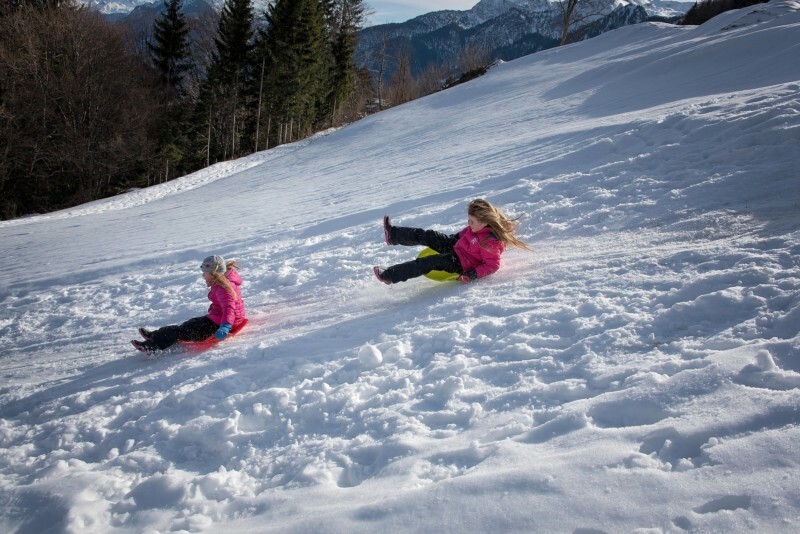 ¡Vamos a la nieve! ¿Qué ropa empacamos? Our guest authors come from a wide variety of backgrounds, but each has something unique to contribute for the traveling mom.